James Bond is back where he belongs.Anthony Horowitz's new novel is a thrilling tour de force, sure to delight fans of the original 007 novels and new readers alike. It also features previously unseen material written by Bond's creator, Ian Fleming.The story begins in the lethal world of Grand Prix and an attempt by the Russians to sabotage a race at Nürburgring, the most dangerous track in Europe. 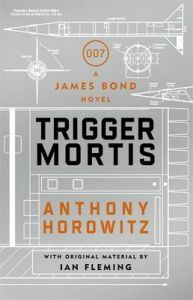 Bond is in the driving seat but events swiftly take an unexpected turn, pitching him into an entirely different race with implications that could change the world.Anthony Horowitz recreates the golden age of Bond, packed with speed, danger, strong women and fiendish villains, in this brilliantly authentic adventure. Anthony Horowitz is one of the UK's most prolific and successful writers. His novels The House of Silk and Moriarty were Sunday Times Top 10 bestsellers and sold in more than thirty-five countries around the world. He was recently commissioned by the Ian Fleming Estate to write the James Bond novel Trigger Mortis. His bestselling Alex Rider series for children has sold more than nineteen million copies worldwide. As a TV screenwriter he created both Midsomer Murders and the BAFTA-winning Foyle's War; other TV work includes Poirot and the widely-acclaimed mini-series Collision and Injustice. Anthony has recently joined the board of the Old Vic and regularly contributes to a wide variety of national newspapers and magazines.